The Meadow, recommended in my posting yesterday, chronicles how men and women built a world within the harsh confines of nature. The power of the book is in the telling of this story: how the obdurate and insistent force of human creative energy and desire interacted with the natural world, in a very specific place and time, to produce a kind of western civilization that verged on the magnificent. The Meadow takes place on and around the borderlines of Wyoming and Colorado, during most of the 20th Century, right up until almost the end of it, and it makes the reader wistful for what has been left behind, both human and natural. Dave Eggers' newest novel, A Hologram For The King, tells a different kind of story, a story set right now in the present. 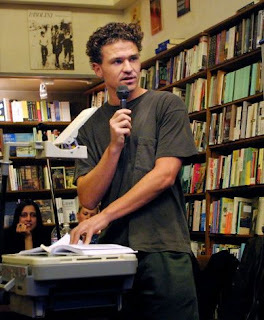 It is Eggers pictured in this image, speaking at City Lights Bookstore, in San Francisco, in 2001. His latest book documents an effort to build a new "place" in the middle of nowhere, in Saudi Arabia. King Adbullah Economic City, Kaec, is a human creation, not yet realized, but in its intention not really reflecting or coupled to the world of Nature or the place where is is being built. Instead of a story about how we build our world within the world of Nature, within which we ultimately have to live, the story of Kaec is the story of how one person is attempting to realize, using money as his material, an "idea" totally generated within the sphere of human action, a city created as if Nature didn't matter. So far, I have only read the review. I guess I have to read the book. It's about the loss of manufacturing in America, too (another kind of human creation tied to nature and to place), and maybe to the redemption and revival of manufacturing here at home. According to Eggers, there may be hope for a return of manufacturing to America. But as for Kaec, I think I know the ending. Any effort to escape the world of Nature is an effort doomed to end badly, probably for Nature, and definitely for us.